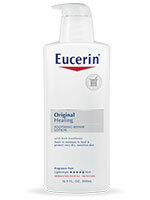 Eucerin Original Moisturizing Lotion 8.4oz has been formulated to help you with any skin ailment you may have. Designed to support all types, Eucerin skin care products can aid you with repairing, moisturizing, and calming your skin. ADW Diabetes offers a large selection of Eucerin skin creams and lotions in both single units and discounted bulk packs for your convenience. Eucerin Original Moisturizing Lotion 8.4oz is specially formulated to repair and protect. This unique, emollients uses simple, trusted ingredients, and no irritating fragrances or dyes, to soothe and help heal even severely dry skin, for noticeably healthier-looking skin that's moisturized all day long. Seals in moisture to heal and protect very dry, sensitive skin. Relieves dry skin associated with eczema, psoriasis, or drying medications. Ingredients: Mineral Oil, Isopropyl, Myristate, PEG-40 Sorbitan Peroleate, Glyceryl Lanolate, Sorbitol, Propylene Glycol, Cetyl Palmitate, Magnesium Sulfate, Aluminum Stearate, Lanolin Alcohol, BHT, Methylchloroisothiazolinone, Methylisothiazolinone.